I don't know about you but this weather is confusing the Hell out of me! I am currently sat in Dorset listening to the rain and wind coming down a treat. I can't complain too I suppose, we actually had a snowy January this year and a scorching summer. I even got about a week of my all time favourite weather: icy cold with blue skies and glorious sunshine. So I suppose it's only fair to have some stinking weeks. 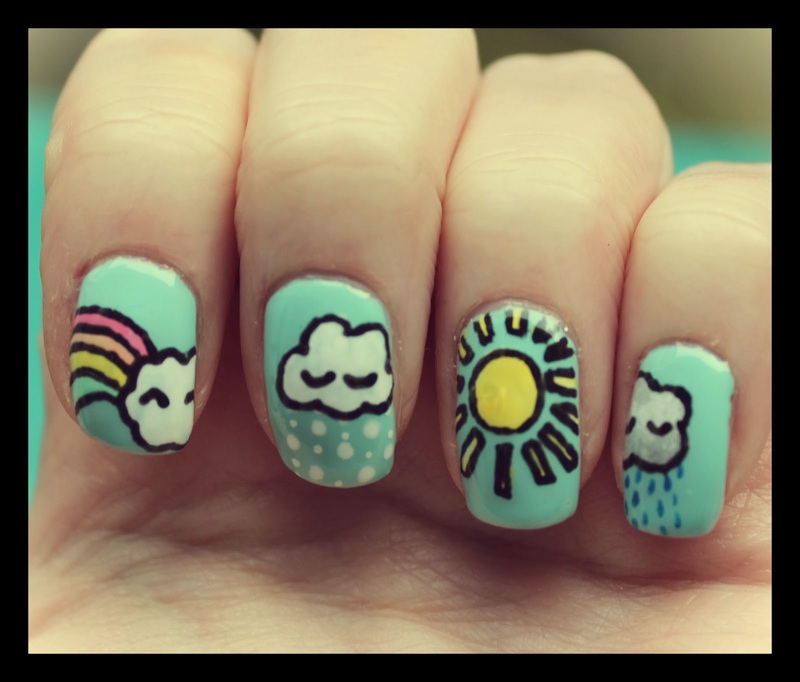 Anywho, the most exciting thing about weather is the inspiration it gives for my nails. How cute are these little clouds? I used nails inc's Portobello Road as my base (little bit obsessed with this shade at the mo) and a selection of Barry M pastels for the colourful bits. I used Barry M nail pens for the outline and the clouds. Little tip: Use a white base underneath the pastels to make the colours stand out more.